CI (Continuous Integration) configuration for ROS (Robot Operating System). Other than the brief introduction in this page, you can also check the detailed doc here. Checks if your package builds, installs without issues. If unit/system tests are defined run them. ROS Prerelease Test can optionally be run. Proven to cover the general requirements of the ROS-based robotics repositories. Easily configurable. Users can add custom pre/post processes. Covers ROS Hydro, Indigo, Jade, Kinetic, Lunar, Melodic distribution. This repo provides scripts for Bitbucket CI, Gitlab CI, and Travis CI only, but it can be easily adapted for other CI services. With a few steps, you can start in your client repository using CI confiurations stored in industrial_ci. Activate CI for your github repository on Travis CI). You may do so either at https://travis-ci.org/profile/YOUR_GITHUB_ORGANIZATION or at https://travis-ci.org/profile/YOUR_GITHUB_USER (depending on where your repository sits). Note: The name .industrial_ci is NO longer REQUIRED for the cloned folder starting version 0.3.2; you can pick any name (recommended practice to keep the folder hidden (by prepending \".\"). Enable CI for your repo. Please refer to official doc for the steps to do so. Note for Gitlab CI, necessary steps might be different between hosted version (i.e. 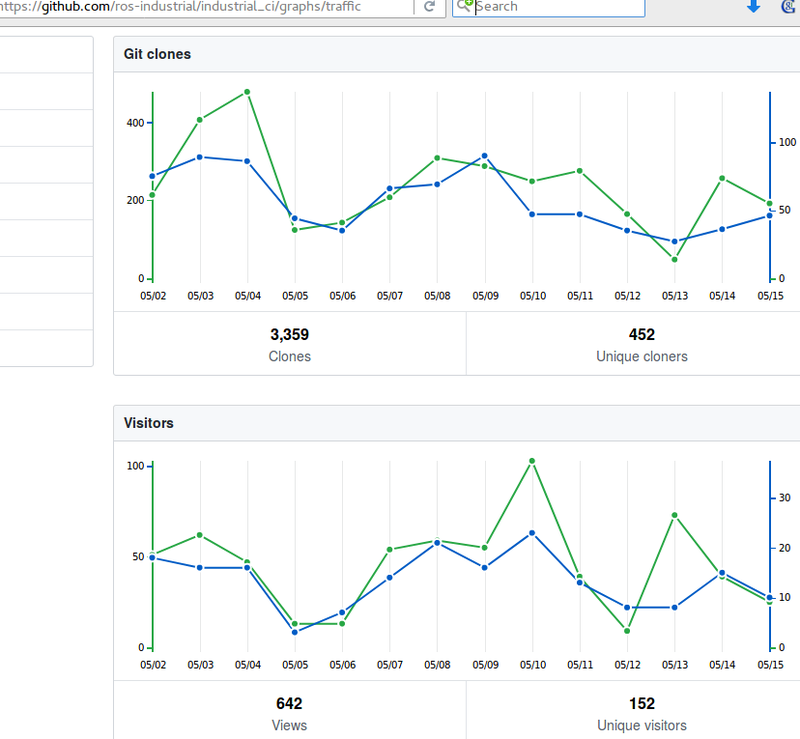 the one on gitlab.com) v.s. the one on your own server, which Gitlab doesn\'t always clarify in its documentation. : 1. For your server version, enable a runner for your Gitlab project which uses the Docker executor. See instructions on how to install and register such a runner with your Gitlab instance if you haven\'t done so yet. Enable CI for your repo. Please refer to official doc for the steps to do so. A template for Travis CI. : - example 1 (Indigo and Jade compatible). - example 2 (Indigo, Jade, Kinetic compatible. Also runs ROS Prerelease Test). For more complexed example: .travis.yml from the same repo. You can see how options are used. For Gitlab CI, a small sample config. 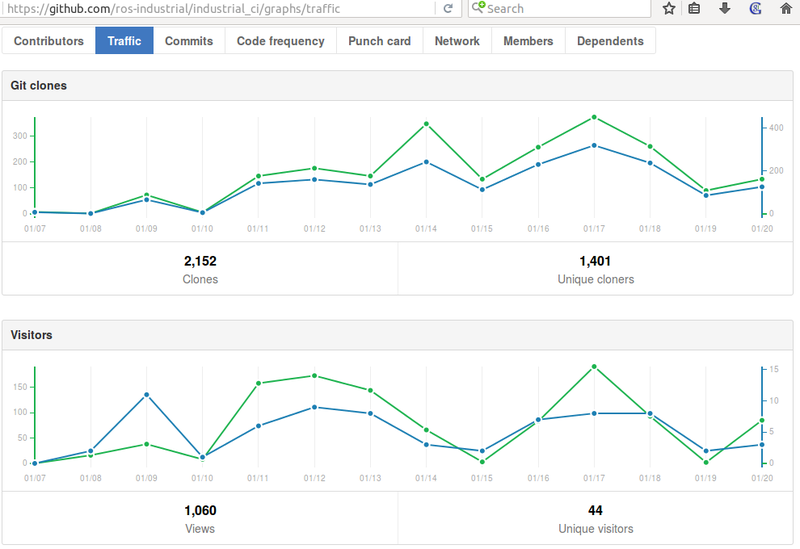 Github--> Graphs --> Traffic view (visible only to admins).